Sometimes all it takes is some Magnetic Fields to see the subtext. People are obsessed with the relationship between Breaking Bad’s Walter White and Jesse Pinkman. A friend who I turned onto the show told me last summer that he thought Walt was in love with Jesse. I don’t actually think that is the case, but as my friend made his case, I realized that the show makes their relationship ambiguous enough to lend itself to that interpretation. 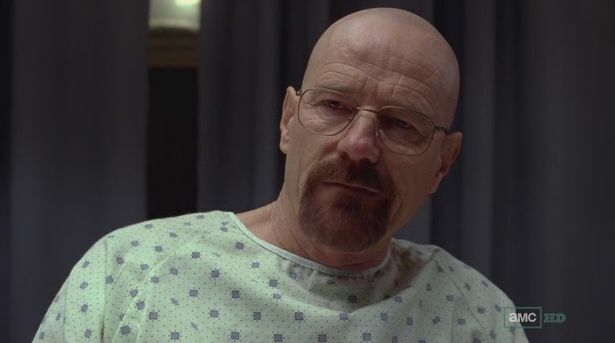 Is “Breaking Bad” a critique of U.S. health care (or lack thereof)? 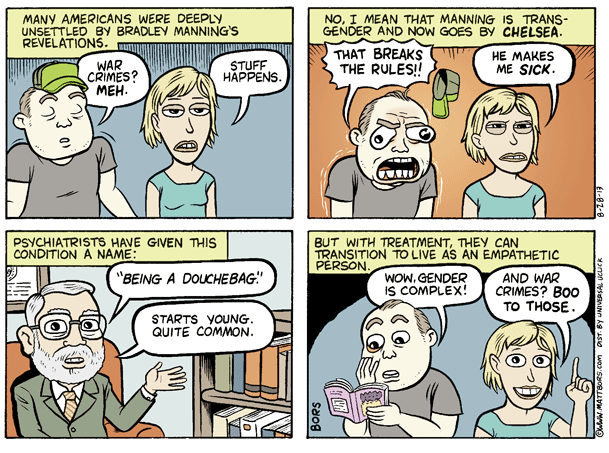 Comic Matt Bors takes on the mental condition related to Chelsea Manning’s transition. The good news is there’s treatment! (See above.) And if you are offended by the term douche-bag, read this. An educational video game asks players to navigate all the barriers to abortion access in Texas. How Victorian architecture aimed to segregate and isolate certain emotional displays of women. Autostraddle has a behind-the-scenes look at the early days at Bustle. Apparently, Bryan Goldberg decided to make a site for women because he’d signed a non-compete clause making the young male demographic off-limits, and he didn’t want too many “smart” writers. In anticipation of the 50th anniversary of the March on Washington: Michelle Alexander on MLK and mass incarceration. Necessary tension around Obama at the March’s anniversary. The real work of Rosa Parks. Chelsea Manning, media bias, and cissexism. Graphic novel of This is How You Lose Her coming soon. Bustle founder didn’t want too many “smart” women. Three types of Golden Girls commenters on YouTube. Is Cher’s new video about solidarity or interchangeability? On Raven Symoné’s quiet coming out. 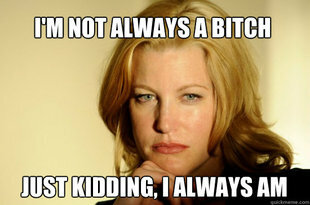 The Skyler White problem: can we accept complex female characters? Sophia McDougall’s great article “I hate Strong Female Characters” has been posted all over my social networks in the past week. I agree that female characters in pop fiction rarely get to be full, complex people, and that “strength” often functions as another one-dimensional, unrealistic cliche.